Leeds United head coach Thomas Christiansen labelled his side’s display in their 2-0 win at Nottingham Forest as the best since he took over. The victory at the City Ground came courtesy of a goal in each half from Kemar Roofe and Ezgjan Alioski and was more comfortable than the score suggested with the Whites dominating all over the park to maintain their unbeaten start to the campaign. Forest never really troubled keeper Felix Wiedwald as Leeds defended solidly with Pontus Jansson in great form again alongside Liam Cooper and United closing down their opponents all over the pitch. They did not create a huge amount of chances themselves, but carried the much bigger threat with Roofe enjoying the lone frontman role again, Samuel Saiz once more brilliant at times in the number 10 role and Alioski a constant threat down the right hand side and when he came in to support the attack. “This could probably be our best game so far,” said Christiansen. “Tactically we neutralised a very good Nottingham Forest side who had just beaten Middlesbrough and Newcastle. “We have beaten them on their home ground and not only am I happy, I am also very proud of my players. Everyone was very good. “It is great that we have kept four clean sheets now. It looks good on the table, but it is also good for the confidence of your defenders and your goalkeeper. Leeds started well and quickly established control with Saiz only inches away from a spectacular goal with a shot from outside the box. Pablo Hernandez volleyed wide and Kalvin Phillips was off target with a shot before Roofe headed home the opening goal after a free-kick was not cleared and headed back in by Cooper to his striker who was the only one to react. 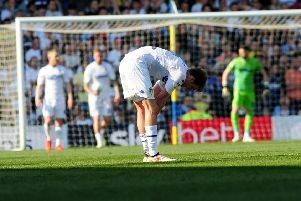 Roofe had another headed chance, but a more difficult one after being picked out by Alioski and could only send in a weak effort that was easily saved. Leeds keeper Wiedwald made his one proper save just after the half-hour as he got down well to keep out Matt Mills’ effort in a crowded box. The German also came off his line to prevent Ben Osborn from getting a shot away after he had run through. Leeds remained largely in control, however, although Saiz could not his shot down when well placed. Alioski saw an angled free-kick saved as United re-established control after the break. Saiz fired just wide from the edge of the box and Alioski saw a strike from outside the box saved. The game went through a quiet spell before United came up with a big finish. Sub Stuart Dallas saw his shot fizz just past the post following a superb pass by Saiz then Leeds sealed their victory as Phillips won the ball and fed Alioski who came up a crisp shot from the edge of the box that found the net to make it 2-0. Dallas and Saiz were both off target with further shots as United showed they were good value for their win. Forest: Smith, Darikwa, Mills, Traore, Worrall, Bouchalakis (Brereton 51), Bridcutt, Dowell, McKay, Osborn (Clough 63), Murphy (Cummings 71).